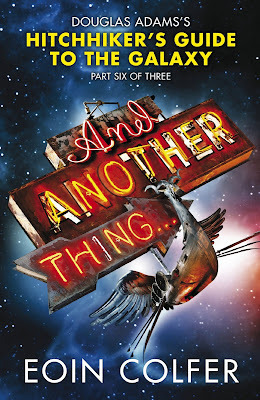 Released this week in Australia is the sixth book in the increasingly innacurately named Hitchhiker's Guide to the Galaxy trilogy, And Another Thing. It's made even more unlikely by the death of genius creator Douglas Adams back in 2001. The story has been taken up on the 30th anniversary of the original by Eoin Colfer, author of the Artemis Fowl books. It was a controversial decision and Colfer himself is frank about his reluctance to write the book because of the great legacy and the vengeful fans of the original. Colfer begins by bringing the original gang back together. Arthur Dent is enjoying a hermetic existence on a beach, while Ford Prefect is living the dream at a ultra-luxury resort courtesy of a Dinocharge card he's fiddled last time he was in the Guide office. Random Dent (daughter of Arthur and Trillian) has gone on to become Galactic President and married a rodent - mostly to annoy her mother, Trillian. And Zaphod Beeblebrox is admiring his reflection in his ship The Heart of Gold. They're all brought together again by a bird-like droid that seems to be running low on battery. It's reassuring to see the old characters thrown together again and there's plenty of the same playfulness of ideas that marked the original. The nostalgia ("Ha ha, Vogons!") may just be enough to swing you through the whole book or it could seem like mawkish repetition. Personally, I'm lapping it up, but still feeling a little queasey about the motivations. Colfer seems to be writing with the reverence of a fan (he has no plans to write another) and the book was released with the approval of Adams' widow, but Penguin books seem to be talking franchise. Part of the inspiration for this new book was Devil May Care, a sequel in the James Bond series penned by Sebastian Faulks. The book was Penguin UK's fastest seller, with readers ripping more than 44,000 off the shelves in the first four days. Marketing folks wiped a tear from their eye as they talked about the power of the Bond brand. Could the future of books be cashing in on literary legacy? If you're feeling uncertain but curious, the miracle of globalisation means you can pop over to BBC's Book at Bedtime where they are serialising the book over the coming weeks (Update: it has almost disappeared - two episodes still available). While Adams was an advocate for micro-payments for content, he also lamented that "The world is controlled in a top-down way by large hierarchies that have control over us". Snaffling the free audio while you can could be a fitting tribute to a multimedia pioneer.